I've seen a few of these kind of posts and videos around and thought I would give it a go. It's always good to have a clean out of some makeup that you either don't use or has gone bad. So I thought it was about time for a cleaning sesh. I do this on a regular basis anyway as I'm always reorganising my makeup and storage etc. but surprisingly (or not) I still have quite a few things. There's something known as an Autumn clean isn't there? Doesn't have to just be Spring cleaning does it? With having fair skin, it's difficult to find foundations that match, which leaves me with quite a few foundations that are still perfectly fine to use and I've probably only used once and that's it, but that don't match me and make me very Oompa Loompa-esque - not a good look. So here is some of the ones that I will be giving to friends and family. 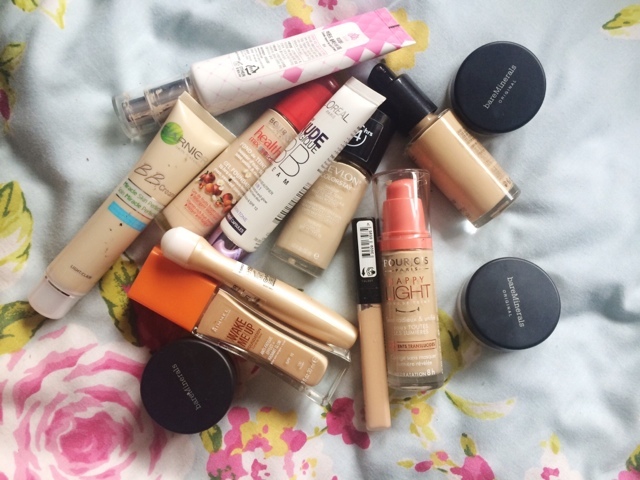 There's quite a few different foundations and concealers in here, but starting off with some Bourjois ones, there's the Happy Light in 50 and Healthy Mix Serum in 51, great formulas, pants shade selection (sort it out already, Bourjois). There's a Rimmel Wake Me Up Foundation. There's a few BB creams from L'Oreal and Garnier and then some concealers including the Maybelline Fit Me Concealer which is far too dark and orange-y toned for my skin, and a Garnier Eye Roll on Thing-ma-jig (yep, exact name) which was also very orange. There's a few lip products here that I just don't wear, so it was time to boot them out of my collection and make room for more, I mean clear some space for more makeup, no, wait, I mean just throw away as I have far too much already, yes, I'll go with that answer. Phew. 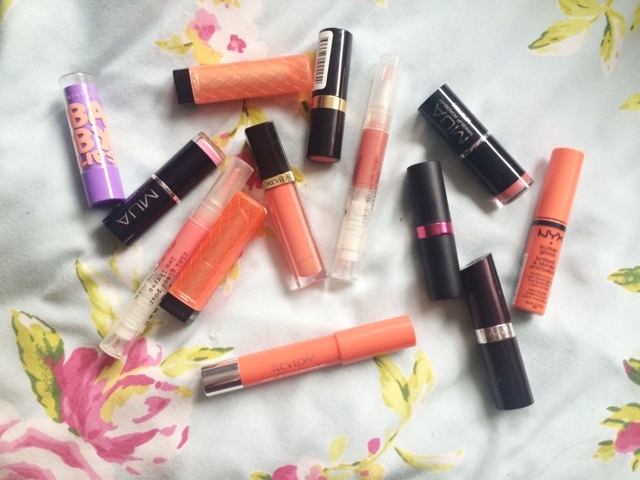 Corals and oranges aren't really my colour which is why most of these lip products are orangey toned. In this pile there's some Stila Lip Glazes, Revlon Lip Butters in Tutti Fruitti and Juicy Papaya. There's a Maybelline Baby Lips in Peach Kiss which I completely hated as it was just terrible. There's also some MUA Lipsticks in shades 7 & 4 and a Revlon Lip Gloss in Coral Reef, I like the Revlon lip glosses but it's coral so it's outta here. Here is the stuff I am throwing out as it's either too old and has expired, not in a good state to be given to a friend, or simply just not even worth the hassle of trying to find a new home for it. So in here we have some BB Creams from Skin79 which were still too dark for me, another Garnier BB Cream which makes me look like I've rolled around in a puddle full of greasy, oily, gross-ness. 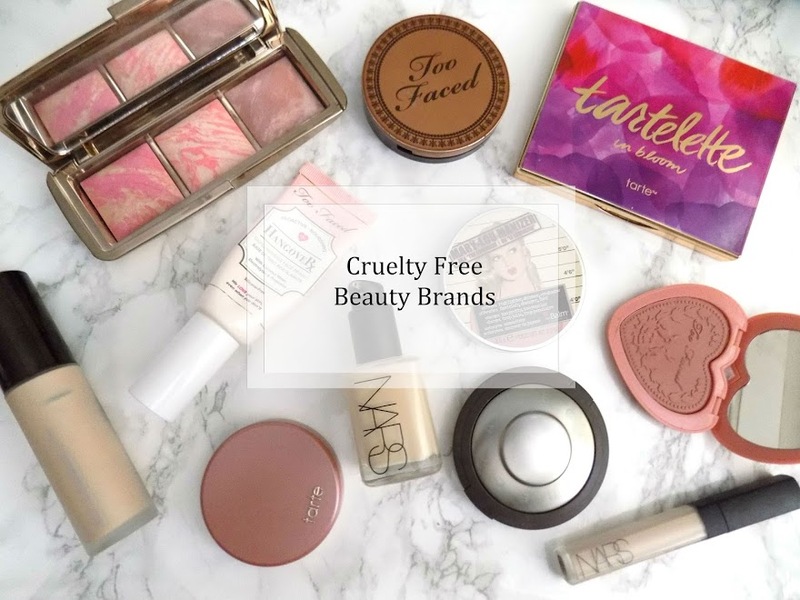 There's some concealers from Rimmel and L'Oreal as well as a YSL Touché Éclat. There's a Revlon Colorstay Whipped Foundation in Buff which is too dark for me. There's also a mascara from Seventeen, a few lip glosses from Revlon and Bourjois and a Brow Gel from Revlon which is looking a tad worse for wear. So, there's my makeup clear out. It always feels much better to do this and I now have more room to store my current makeup collection. I think I should go on a bit of a spending ban for anything beauty related. Oh goodness, that sounds like my worst nightmare. 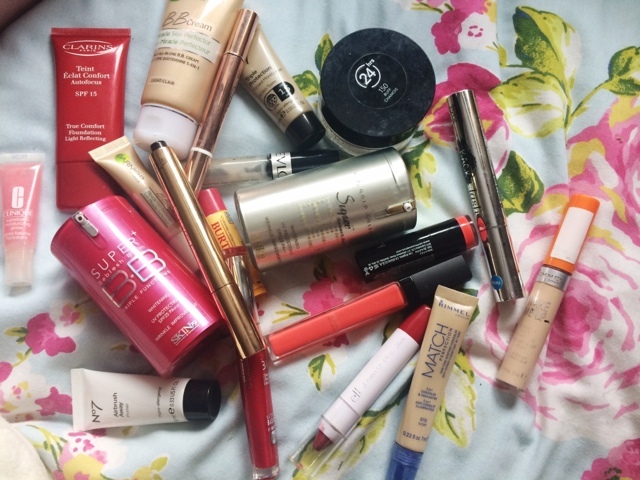 When do you tend to clean out your makeup collection?